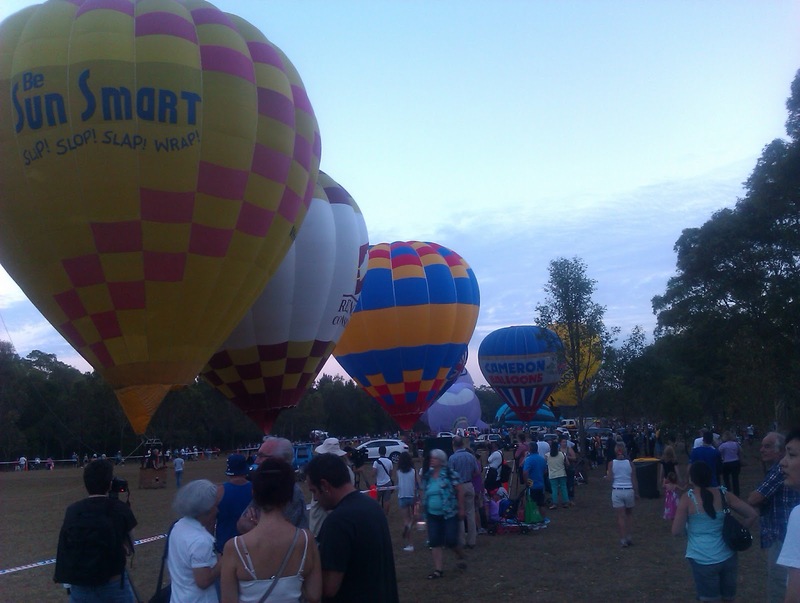 This morning we went to Parramatta Park to watch the hot air balloon launch, which is part of the park’s Australia Day celebration. It was an early start, with our alarms set for 5am. We were out of the house not long after that, and got to the park before the 6am start time. 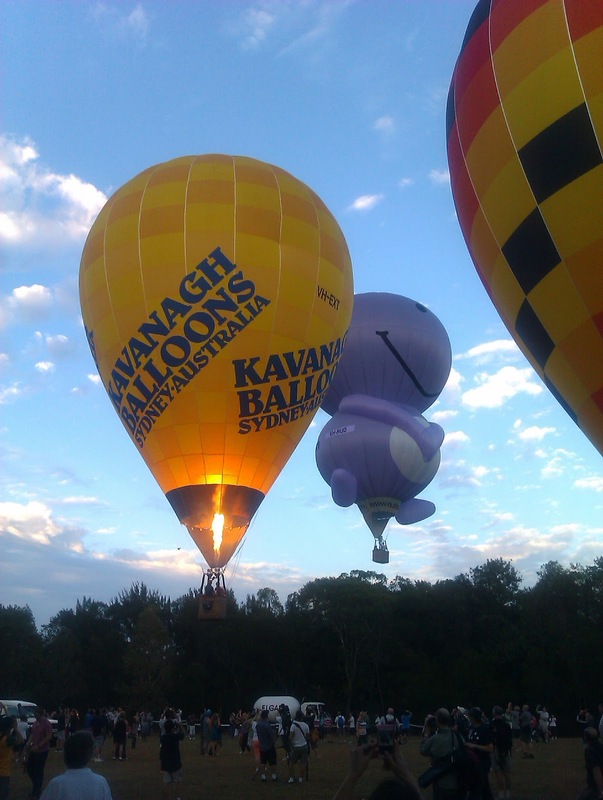 There were 16 balloons all together – eight of them remained tethered for balloon rides, and the other eight took off, and headed in a south-westerly direction. I wonder where they ended up landing? Once we’d seen the balloons, we had some breakfast (sausage sandwiches, courtesy of the Lions Club BBQ), and then had a look at some of the entertainment that was there. Thomas went into the Circus Playground, and had a go at some of the activities there, such as walking the tightrope, and spinning a plate. We left at about 8am, and the boys both fell asleep on the way home. I think they’ll go to bed tonight without any difficulty. It was a big day for us today. Our eldest son, who’s four, started pre-school today. He’s been really looking forward to it for the past few weeks. Today he headed off with his back-pack and lunchbox, looking very grown-up. The drop-off was totally uneventful – he’d finished the first of the day’s three paintings before we’d even left! When we picked him up, the teacher said he’d been fine all day, which is what we’d expected. He answered all our questions about his day, and is looking forward to going back tomorrow. There are a few geocaching-related goals that I’d like to achieve this year. The first of these is to reach a total of 300 finds. We’re currently at 267, so we’ve got a little way to go. If we can plan a few “cache-a-thons” throughout the year, then we should be able to get there. Our current record for most caches found in a day is 12, which we achieved back in August 2010. I think we’ll need to break this record in order to get to our goal of 300. The other goals don’t relate to numbers, but are more about the caching experience. One of them is to complete our Difficulty/Terrain grid up to 3/3. What this means is finding at least cache in each of the 25 combinations of Difficulty and Terrain from 1/1 up to 3/3 i.e. 1/1, 1/1.5, 1/2, 1/2.5, etc. If this sounds confusing, click on the Geocaching Stats box on the top right-hand side of the blog page, which will take you to our profile on geocaching.com. Click on the Statistics tab and you’ll be taken to our our Statistics page, where you can see the grid. Currently we’re only missing the combination of Difficulty 1/Terrain 2.5 and there are a few caches around with that combination, so hopefully this goal will be met this year. Finally, there have been a couple of “challenge caches” published recently which I like the sound of. A challenge cache is a cache with geocaching-related criteria that you need to meet before you are allowed to log the cache. The first is the Old School Challenge – New South Wales. In order to log this cache you need to find 10 of the 44 caches in NSW which were placed in either 2000 or 2001. Currently we’ve found two of these old caches, and we’ll see if we can find another eight during the year. The other challenge cache that’s on my to-do list is the Variety is the Spice of Life Challenge Cache. For this cache you need to find five different cache types within a 24 hour period. We’ve found six different cache types altogether, but not on the same day. For an extra challenge, I might see if we can do the challenge without finding a Traditional cache, as there are a lot of those around. There are two cache types that we haven’t found which are in our local area (Letterbox Hybrid and Wherigo), so it would be nice to include these as part of the challenge. It would be nice to achieve all of these goals this year, but I’d be happy to get any of them done. Today I went out and found our first caches for the year. My siste came too, as she is a cacher too. Because I didn’t have the boys with me, we could tackle some of the harder terrain caches in the area. It was a successful day, with three out of three caches found. Our first cache was One in a Hundred-EcoTeam #6, which is considered a must-do cache in the Sydney area. It was placed in 2002, and illustrates what I think caching was all about in the early days. It was in a local area of bushland, and was a multi-cache, so there were a couple of waypoints that had to be found before we could find the final container. My sister had found this cache previously, and was willing to give me some hints when I asked for them. If she hadn’t been there I think I’d still be looking for the first waypoint! There’s a picture in the gallery for the cache which led me on a wild-goose chase, and it was only after consulting my resident expert on the cache that I was looking in the right spot. The second waypoint was easier to find than the first. From reading the logs of previous finders, there’s an easy way and a hard way to the final location. My sister knew the hard way, but I wanted to see if we could find the easy way. After retracing our steps to the walking track we’d come down, we took a turn to the left and followed a track to the general area where the cache was hidden. After a bit of a search I found the container, and it was to find a nice large bucket, which was well-stocked with books. After a stop for lunch, we headed off for a cache which neither of us had found. It’s been rated with 5 stars for terrain (the highest rating possible, which usually means that you need special equipment to find the cache e.g. abseiling gear, boat). However this cache should really be rated at about 3.5 stars for terrain. It does involve a bit of a scramble down some rocks, but it can be done without any equipment. This was the first 5 star terrain cache for both of us – it’s nice to have it listed in our statistics but I suppose it’s not a real 5 star hide. On our way to the cache we heard movement in the bush down below us, which turned out to be wallabies or kangaroos – we didn’t see them in any great detail but my sister did spot a tail to confirm that they weren’t muggles (or fellow geocachers). On our way back to the car we walked past another cache which we were able to find. This one was a bit more straighforward and was a fairly easy find (my sister found it). Today seemed to be our day for encountering “interesting” people during our searches. At the first cache, a gentlemen came down the track and chatted to us about the graffiti that is on the very large structure that the first waypoint is located in. He was harmless enough, but we felt better when he moved on. Our second encounter was on our way back from the 5 star cache. While we were searching for it we could hear a noise nearby, but couldn’t think of what it was. Turns out it was a group of three teenagers letting off their potato cannon. They left not long after we passed them.